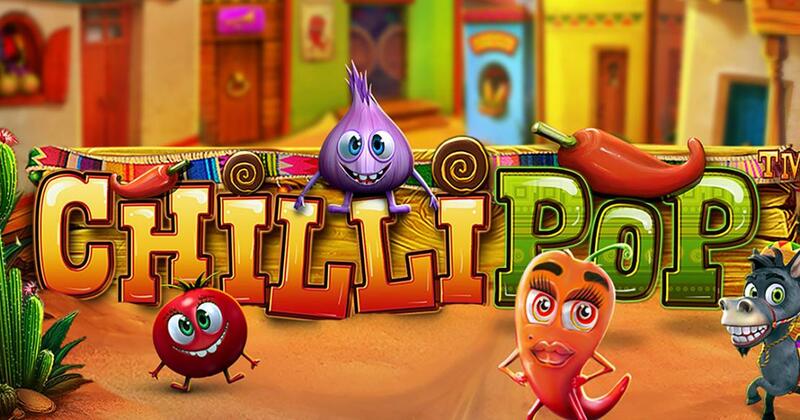 One of Betsoft’s games, Chilli Pop will have us traveling to Mexico and enjoying the local cuisine and culture. Chilli Pop delivers Mexican themed graphics, with a small town from the country being the chosen image for the background of this slot machine. You get fiesta-ready reels in front, where the action is, and the symbols picked for them are mostly inspired by various chilli peppers and vegetables. The Mule is one of the few symbols which will stand out as different, along with the Star-shaped pinata. The other symbols involve red and yellow chilli peppers, onions, bell peppers in about three different colors (orange, red or green), tomatoes and leeks. They turned these vegetables into cute characters, smiling or going crazy on the reels, so the view is an interesting one inside. As for the way the game is played, you will need to have clusters of 3 or more symbols formed, on the 5×3 reels of this slot. Features will include scatters, free spins with a Mule Trail which can make the game area bigger, while wild symbols can add multipliers. A big payout is going to reach a value of 1,000x the stake, or $50,000. You’re wagering in this game with 50 coins, so the only option is to pick the denomination for them. It varies and goes from $0.01 to $1, so the total amount wagered is between $0.50 and $50. There is also the Buy Feature option, for which you have to spend 49x the usual stake. The Clusters are formed out of 3 to 15 matching symbols, and for each type of symbol there is a prize associated with it. The best is 12x the stake per symbol in a cluster, before multipliers apply. Speaking of multipliers, those come from the Pinata wild, which improves wins with each symbol that it contributes to a win. The multipliers can add up quickly thanks to this wild. It also pays directly, and a cluster of Pinata wilds can deliver up to $50,000. The Mule is your basic scatter, which may appear anywhere. As long as you have 3 or more, the game delivers 5 to 26 free spins for you to use. Get extra Mules during the free spins, to increase the size of the game area, to as much as 8×8. Chilli Pop can be plenty of fun to play, and Betsoft did a decent job turning it into something unique for the player. Try of out a demo version of Chilli Pop.